We rode wheelchairs around campus for our second lab section. For three hours, everyone in our class was equipped with a wheelchair and given a set of tasks to complete. Those tasks included: getting a drink from a water fountain, using the bathroom, and looking for a book in Hayden library. The entrance to Lobby 7, an iconic view that would apparently be ruined by installing a more accessible ramp. Right away, I found out that navigating campus in a wheelchair is a very difficult task, requiring backtracking multiple times in order to make it to the library. Afterwards, I decided that I wanted to go to the student center across the street. Going from Lobby 7 to the street took me three minutes. Three minutes instead of a handful of seconds, for anyone who can simply take the stairs. My experience navigating in the wheelchair was not bad, when compared with what my classmates had happen. One person wanted to board the Tech Shuttle, but the ramp to get on was broken. Another classmate was physically lifted by strangers to get him into a too-full elevator, without asking permission. Others got stuck in construction because the sidewalk was gone, and someone had to help them out. MIT does have accessibility information online. They have a map that details accessibility features of campus that you can download. 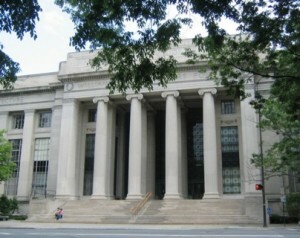 MIT also has an app. This app includes many useful features, including a list of helpful links. However, accessibility information is not in that app, nor is it even linked to. Additionally, however nice the accessibility map of campus is, it is static, unable to update to show construction hazards. It would be nice if there was a map as part of the app that showed construction hazards on a more real-time basis. In addition to making campus more accessible, MIT needs to seriously consider how accessible their accessibility information is. Picture the scene: A tornado is headed your way, and you’re driving on a flat road. An overpass is in sight. So is a ditch. What do you do? Do you run to safety? But what if you can’t run? What if you’re alone at home, in the path of the tornado, and have no way of hearing or seeing tornado warnings? These basic – yet powerful – examples underscore the need for inclusive or universal design-oriented thinking, most evident in the design of contemporary fire alarms (with both sound and sight functionalities), and street lights (with sound, sight, and tactile functionalities) that serve as indicators for people with disabilities. 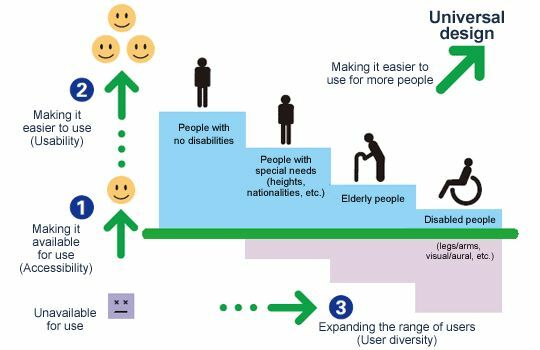 Prior to attending a lecture last week by Professor Chi Kim, a specialist on assistive music technology at the Berklee College of Music, I hadn’t given much thought to the importance of Universal Design – or the importance of creating multi-sensory solutions. Then, after reading Cowan’s article (linked above), I realized that I had also never thought of the challenges people with disabilities faces during a natural disaster, and by extension, the devastating impact of sudden or chronic natural disasters on people with disabilities worldwide. From monsoons to earthquakes to avalanches, Cowan writes, “Some families find it easier to just abandon the [people with disabilities] during disasters than trying to bring them along.” But what about political, social, or economic crises? If this is the history of design, what does the future of design look like? History of Design, from livewellcollaborative.org. Our projects require that we think about ‘environmental’ context and the sustainability of design for both product and user, among others. But I can’t help but think of how our “solutions” would be influenced by variables faced by people with disabilities across the world…or even outside of Boston. Variables I didn’t even begin to consider until last Friday. I have immense respect for the countless engineers and designers and product managers (etc etc) that have enabled and empowered their users to lead more independent lives. I’ve only now begun to think this way, but I’m grateful for the opportunity to continue learning about assistive technology, the importance of universal design, and how these interact with built, social, and natural environments. When I was in kindergarten and first learning to play the piano, I found that learning to read and interpret music helped my overall reading skills, and that practicing the instrument every day helped me be more patient and focused. Although that was just my experience, there’s actually a lot of research to support that music can help with various skills such as cognitive skills, communication/speech, motor skills, and even social skills. While music can be beneficial to everyone, it’s especially interesting to look at how music therapy can be used to help people with disabilities. Music is similar to language in a lot of ways – both have rhythm, pitch, and are built from patterns and structure. Studies show that music therapy (which can include activities such as playing instruments and singing) can actually boost memory of sentences and words, and understanding of sentences. This can be especially useful in children with delayed speech development, to help them improve their language skills at a young age. Music has also been shown to help with attention. 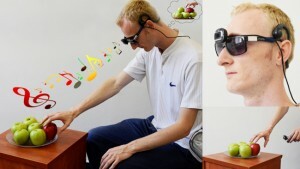 It can be useful for someone to learn a task while music is present to increase their ability to focus. This can help people with ADHD, for example. Specifically, music increases dopamine levels in the brain, which is a neurotransmitter that is in low supply for someone with ADHD. In fact, drugs used to treat ADHD, such as Aderall, boost dopamine levels in the brain. Music provides a natural way of doing this. Finally, music is a naturally social activity that can be relaxing and stimulate different emotions. Music makes people happy, and can bring people together. 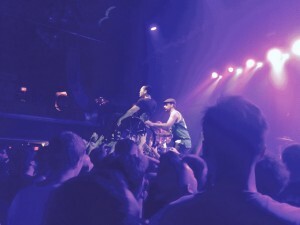 At a concert I went to a few weeks ago, a man in a wheelchair was in the crowd rocking out to the music, having a great time. During one of the songs, the crowd lifted him up and carried him around, allowing him to crowd-surf. I found the scene particularly inspiring and snapped a photo. Music has direct benefits to various cognitive, social, and other skills. It’s also a great way to bring people together and boost happiness. The assistive technology industry is often about individualization and specialization; each physical and cognitive disability is different, and so, such personalization is completely necessary. It ensures that the client receives exactly what they need, fitted to their preferences. Since the market is so small for each device, the prices skyrocket. Often, we find groups spending an immense amount of time solving one problem for one client. The time spent on designing and developing the device alone is very costly, and this doesn’t even account for the materials and technologies needed. Even devices that can be more widely used are quite expensive. This often puts it out of reach financially for those who might need it. For example, Liftware created a stabilizing handle with different attachments (spoons or forks) to help individuals with shaky hands eat more easily. The starter kit costs around $300, which is perhaps not a high price to pay for an easier eating experience, but for many people $300 isn’t something they have to spare. Is there a way to change this? How do we make these much needed technologies more accessible and more affordable? Too often profit is prioritized over the needs of individuals. Many of these devices and products do exist, but people simply can’t afford them. There is a lot of work to be done about this. My team’s project involves adapting eye-tracking as a way for Mark to use his computer at work. In this post I’ll give a whirlwind overview of the various applications and methods of eye-tracking. What is eye-tracking? Eye-tracking is the collection of data about the rotation of the eyeball within the socket. Most often, we are interested in where the gaze of the eye rests on a page or on a screen. This data can be used for many purposes. Eye-tracking data can be used to study human perception and cognition. For example, a recent trend in web usability studies involves taking into account the pattern of a user’s gaze while navigating a website. In addition, marketers may use eye-tracking to study where the most effective advertisement placement is. 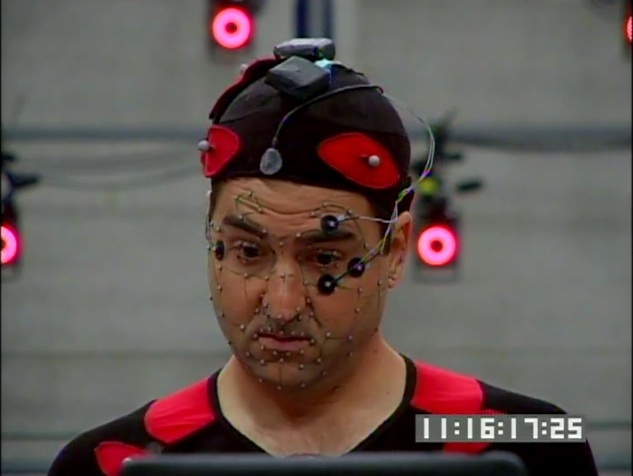 More recently, technology developers have explored using eye-tracking as a means of human-computer interaction. This is where assistive technologies come into play: eye-tracking provides a means of interacting with the computer–of controlling the cursor and entering in keypresses–for users who cannot use a mouse or keyboard. 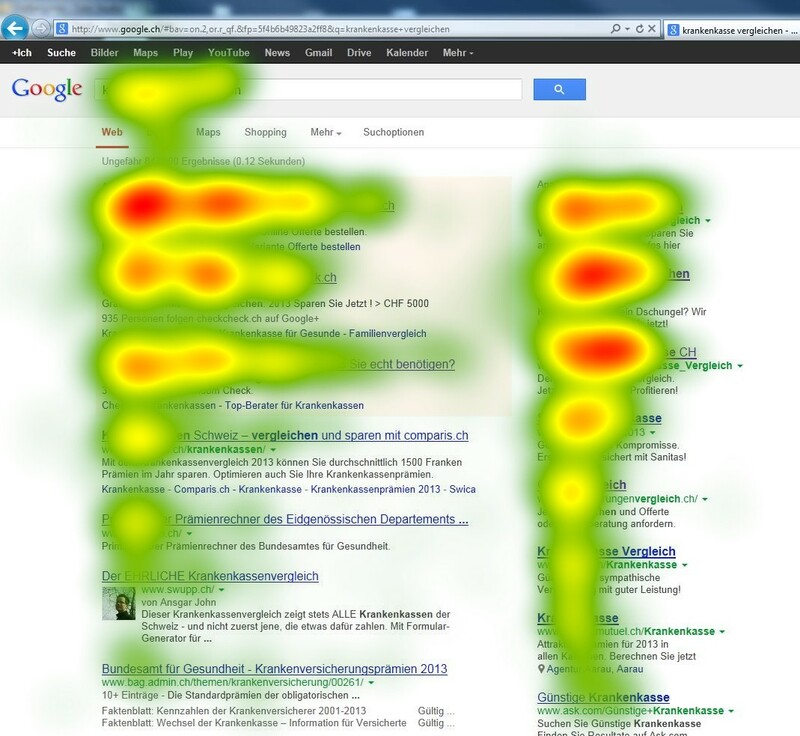 There are three main categories of eye-tracking methods that have been found. The first involves attaching a physical object to the eye. This was the first method to be developed, in the early 1900s, by an educational psychologist named Edmund Huey. Huey’s device consisted of a contact lens, with a hole for the pupil, connected to a small aluminum rod. This method has the advantage of being very accurate, but the disadvantage of being physically intrusive. The second category consists of measuring reflection of light, whether infrared or visible light, across the eye. Specifically, a camera measures reflection of light from the cornea and then performs video computation to find the eye gaze. This method has the advantage of being low-cost and un-intrusive, but the disadvantage of being less accurate and highly sensitive to lighting conditions. Finally, the third category involves placing electrodes around the eyes and measuring the electric field of the eyes. As the eye rotates, the electric field changes. Unlike the other two methods, the eye gaze can be measured in this fashion even when the eyes are closed; this is its most salient advantage. However, a disadvantage of this method is that it requires wearing a device and a lot of setup. 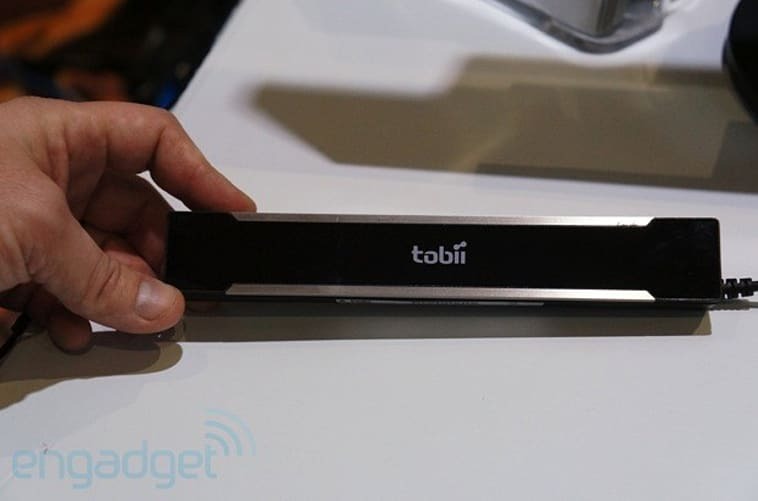 For our project with Mark, we’re using Tobii EyeX, an eye-tracker originally intended for use in gaming applications. We chose to go with the second method of eye-tracking, as it is the only option that is non-intrusive and does not require attachment of any device to the body. Our project is the continuation of a century’s history of making eye-tracking devices ever more useful and usable. I work in a neuroscience lab, where people ask questions like, “What is a mind?” and “How do patterns of neural activity give rise to our thoughts, feelings, and behaviors?” Neuroscientists often note the potential for their work to be applied toward identification, treatment, and understanding of brain differences and disorders. I wonder, however, whether information must always flow in that direction. In a recent lab meeting, we heard from Shachar Maidenbaum, a student in the Amedi lab at Hebrew University. Shachar’s group is studying “sensory substitution devices,” (SSDs) in individuals with visual impairment. The lab has developed an app called EyeMusic that creates soundscapes using a smartphone. EyeMusic translates colors using different musical instruments and represents spatial information with higher and lower pitched tones. Essentially, the app translates the visual world into auditory information. With training, individuals are able to use the soundscapes to identify novel objects and navigate virtual environments; scientists, in turn, are able to study fundamental questions about visual representation and brain plasticity. To me, this work seems to challenge the notion that information must flow from basic science to real-world applications. Rather than waiting on consensus about visual representation in the brain before applying the concept to rehabilitative, assistive technology, this team works “backwards”. They took an assistive technology solution, gave it to real humans – who immediately experience the benefits! – and subsequently set out to learn about the brain. Is this basic or applied science? Maybe it’s time to do both at the same time. This Sunday, I volunteered as a part of the Medical team for the BAA Half Marathon. Stationed at Medical Tent 4 around mile 2.5, I got to see the awe-inspiring performance of the first few athletes leading the race in push rim wheelchairs. Tony Nogueira, a 10-time BAA Half Marathon winner, later won the men’s wheelchair division with a time of 54:16, while Carla Trodella won the women’s wheelchair division with a time of 2:54:44. Although people have been competing in the Boston marathon in wheelchairs since 1970, wheelchair athletes did not get officially recognized until 1977. Bob Hall, who was told by the race director he’d get an official time if he finished in under 3 hours, completed the race in 2:58 and became the first officially recognized wheelchair competitor. Thousands of athletes have since been able to compete as official competitors in the wheelchair division of the Boston marathon. A few months ago, wheelchair racing observed another landmark event. The Abbott World Marathon Majors, which include the famous marathons in Boston, New York, Chicago, etc., announced that it will include an elite wheelchair athlete division in which winners will be awarded a monetary prize. I think this is a huge and very important step in finally officially recognizing these competitors as athletes whose achievements measure no less than those of athletes competing in non-wheelchair divisions. Although there may be those who feel that separate divisions such as for wheelchair racing “other-izes” those who have a disability, I feel that it does the opposite. These divisions allow athletes with disabilities to be not only a part of the big racing community, but also a part of the smaller community of athletes they are competing with, and increases public awareness about the incredible accomplishments of these athletes. First, some background: My home country, Cyprus, is in the Mediterranean sea, south of Turkey. The southern two-thirds of the island is referred to as the Greek side, with a population of about 1,142,000. The northern third is referred to as the Turkish side (where I am from), with a population of about 302,000. Though Cyprus gained independence from the British Empire in 1960, an attempt by the Greek majority in 1974 to take governmental control of the whole island was met with Turkish military resistance. That’s when the de facto division occurred. In 1993, the northern third declared itself the Turkish Republic of Northern Cyprus but the government is recognized only by Turkey. There is still some hostility and little association between residents of the two sides. People with disabilities have some legal rights. Both sides provide disability pensions for those who can’t work. All new public buildings and tourist facilities are supposed to be accessible and qualified people with disabilities are supposed to have hiring preference for public sector jobs. But, enforcement is very weak. A photo of Serdar, taken by me during my last visit to Cyprus. When it comes to people with serious mental disabilities, it is known that their needs are not met in the community. Since in Cyprus families have a strong bond, most people are being taken care of by families and these families have a burden. They need support, they need information, and they need benefits. We have a family friend (55-year-old lady), and her 31-year-old psychotic son, Serdar, is still living with her. We know that she doesn’t even have the support of her neighbors. They think her son is lazy and he doesn’t want to work. People are ignorant because it is an invisible disability. It’s also not easy for families to accept, and they want to keep it quiet. Nobody is talking to people with these disabilities. We need to find a voice for them, and we want to raise awareness in the public also. Nowadays, most people could not imagine living without their smartphones. People rely on their handheld devices to keep up with their email, surf the internet, and more. However, for one subset of the population, smartphones are still relatively difficult to use. People who have visual impairments have to rely on different features of smartphones. 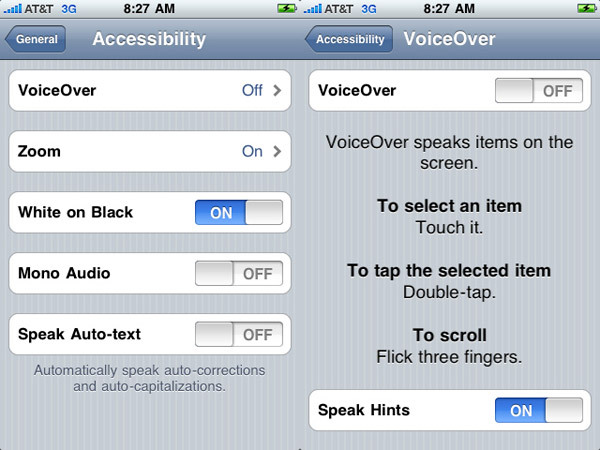 The iPhone’s accessibility menu offers VoiceOver and other audio assistance. Despite these added functionalities, navigating touchscreen smartphones remains a challenge for those who do not have the luxury of seeing all the buttons and text on the screen. During our very first PPAT class, we all tried using the VoiceOver functions on our smartphones, and even when I allowed myself to look at the screen, it was incredibly difficult to navigate through all the pages. 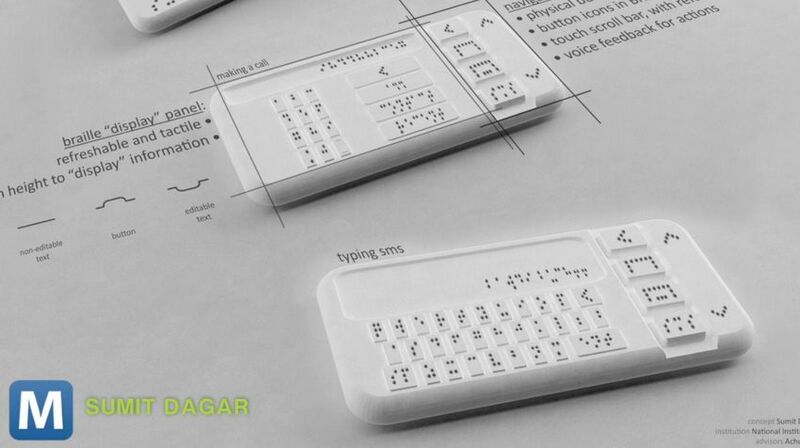 In 2013, Sumit Dagar introduced a braille phone with a screen composed of a grid of pins. A technology called “Shape Memory Alloy” uses the pins to form shapes and characters when the user receives a message and to contract the pins back to their original shape. Dagar and his team of designers at the National Institute of Design (NID) were prototyping and testing the device at the LV Prasad Eye Institute. I think the idea of a braille smartphone is great, and the Shape Memory Alloy technology seems promising. However, even though Dagar’s team hoped to release the phones by the end of 2013, I was unable to find any more information about the product’s actual release to the public. It makes me wonder where in the design process this assistive technology currently is and if the team is still working on it. I would also be interested in learning how big the market is for braille smartphones and if that has any impact on the team’s decision to continue developing the braille smartphone. Years ago, I saw a documentary about Ben Underwood, a boy who’d lost his eyes to cancer, but could use echolocation to visualize space. Ben was so skilled at echolocation that he didn’t use anything else to navigate and was even able to play sports. He could accurately track where a basketball was by using clicks of his tongue, and ride a bike. One of the problems associated with human echolocation is that humans typically prefer to echolocate with one sound, in one frequency (someone might use tongue clicks, while another person may prefer to snap), and there are environments where those frequencies may dissipate quickly in the atmosphere or be drowned out by louder noise. One of the ways some species of bats avoid this problem is using frequency modulation (FM) in successive chirps. These bats also special auditory functions that allow them to pick up and interpret these various frequencies even in extreme circumstances. A company, NeuroPop, is researching new assistive technology that would act as a FM echolocation device, sending and receiving ultrasonic chips, and using algorithms to transform the information into something the user can interpret. White canes and guide dogs have greatly improved independent mobility for those with visual impairments, but an echolocation device may be more discreet, and offer new experiences to its users. Things as simple as exploring new areas or going out with no destination in mind could be enabled by an echolocation device. I was amazed by the fact that humans can echolocate like bats and that we can use technology to enhance those abilities. Amazing abilities have evolved in animals over time. Maybe we should look more towards nature to find inspiration for new assistive technologies.